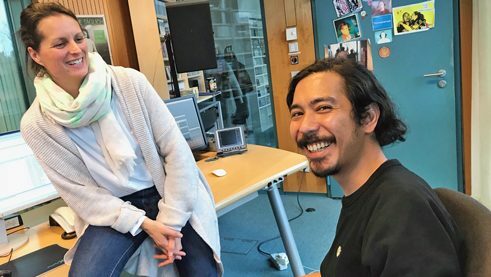 For the Goethe-Institut’s Close-Up journalists’ exchange programme, Cora Knoblauch from Radioeins rbb and Ali Johan from Radio BFM swapped their workplaces in Potsdam and Kuala Lumpur. They talked for The Latest at Goethe about what experiences they are taking home with them for themselves and their stations. Cora: So, Ali, you’ve begun your last week in Berlin. When I came home from Kuala Lumpur, I brought a huge suitcase full of souvenirs and gifts. Is your suitcase full yet? Ali: I already have a few things in mind that I’ll bring with me, but I’ll save the presents for the last minute. Berlin has so much that you want to take home. So far, I’ve bought a button. It says, “Sometimes anti-social, but always an anti-fascist.” I’m taking that for a friend. And fridge magnets for my parents. Cora: What stories will you take home with you? Ali: The live music scene in Berlin is huge. Berlin is certainly an important hub for bands in Europe. You can experience an exciting band or even very famous musicians every night. That was really fascinating for me. Like the mentality of the people in Germany in general. For example, I was fascinated by how people walk on the streets here. At home, people walk quite differently. Cora: On the way to Potsdam today I wondered whether Kuala Lumpur and Berlin actually have a lot in common. Not at first sight. I really had to think it over. I felt at home in Kuala Lumpur, but if someone were to ask me if Kuala Lumpur and Berlin are somehow alike, I would have to think it over awhile. Ali: I think Kuala Lumpur is like a small piece, a little part of Berlin. Kuala Lumpur would be something like a Kiez in Berlin in terms of people’s ethnic diversity, the way the city works. If Kuala Lumpur has ten different things, then maybe Berlin has 100. But both cities are just as diverse. Food for example: I found so many different cuisines and restaurants in Berlin. Of course, there are also many different cuisines in Kuala Lumpur. But where you have twenty Vietnamese restaurants in one quarter of Berlin, you might have two in Kuala Lumpur. Cora: That’s interesting. Because I’d claim the exact opposite. I experienced Kuala Lumpur as much more diverse and multi-ethnic than Berlin. For me, Kuala Lumpur was a city with a whole universe of restaurants and different cuisines. Cora: My month in Malaysia was my first stay in Southeast Asia and this was also your first time in Germany. What surprised or fascinated you the most about Berlin? Ali: Berlin is bursting with creativity! Everywhere something creative is being produced. If only on the walls. Some call it graffiti, some street art, others call it vandalism – I call that the colours of a city. We have something like it in Jakarta, Indonesia. There’s no such thing in Kuala Lumpur. Street artists need a permit for their art or the graffiti is immediately painted over by the city. That limits and intimidates artists a lot. Here, artists seem to be much freer in the ability to express themselves. Cora: Berlin and Kuala Lumpur are very different, so it’s even more astonishing how similar BFM, your radio station, and Radioeins are. That was the most astonishing thing about this journalists’ exchange for me: to enter your editorial office and to see that the way co-workers interact, the relaxed, jovial atmosphere, the open-plan office, eating together is actually all almost exactly the same as in Potsdam at Radioeins – that really surprised me. You can travel to the other side of the world and find journalists who work just like you, are interested in the same topics. Ali: Exactly. I came to Potsdam and, just like you, I’d listened to your programming before, of course, and yes, we even play the same music. Our cultural programme is really very similar. Radioeins and BFM are on the same wavelength. In a sense, BFM is very lonely in Malaysia. 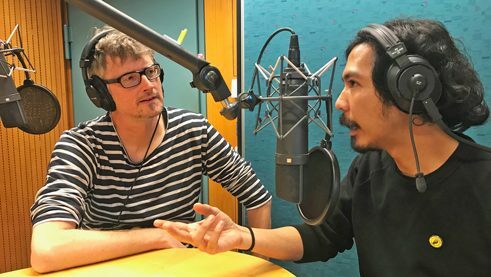 No other radio station in Malaysia has feminist or philosophical programmes. But now that I’ve widened my radar and found Radioeins, it feels like home. I came here to the Radioeins editorial office and didn’t have to explain myself and BFM all that much. We’re cut from the same cloth. Cora: I wish that Radioeins had a programme like “Feminist Fridays” – that’s one you can be very proud of. Ali: And we have a show like that in spite of the rather severe media censorship in Malaysia. We also censor ourselves simply because we have been conditioned that way for decades. At least BFM still regularly addresses sensitive topics in its programmes. Ali: What I’ll take with me from my stay at Radioeins is to be more courageous – to show more attitude and personality. Those are our challenges. What’s the challenge for Radioeins? Cora: Well, Radioeins will never be a radio station for the masses. In a way we’ll always be a niche station. We don’t play the charts, our presenters aren’t constantly making jokes and don’t “entertain” our listeners in a superficial way. The challenge will be to attract new, younger listeners. That’s not easy, because younger people basically seem to be listening to less and less radio. Ali: It’s similar with us. BFM also doesn’t provide any entertainment as usual on the radio. We wonder if we can or should grow out of our niche market. But then wouldn’t we lose our character and uniqueness? After all, tone is everything on the radio, right? BFM and Radioeins have a very similar tone. Cora: I think that we’ll not only take something from this exchange with us for each of us personally, but also something for the future of our radio stations. Ali: I hope so too. In the past, BFM always looked at what and how American talk radio stations do it. Listening to a radio station like Radioeins makes you believe in humanity. We’re not here to amuse ourselves at the expense of others. We’re here to enrich our listeners, to tell them important stories. If BFM and Radioeins stay in contact, we could grow together, grow up together. You’re 20 years old, we’re ten. BFM should look up to Radioeins like a big brother.